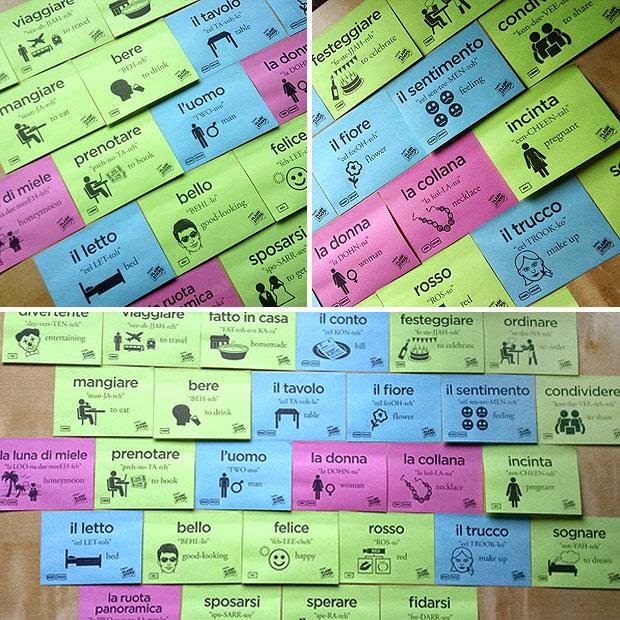 Barby's Travels: Learning Italian is so funny with FlashSticks! I love learning foreign languages, I love teaching Italian to foreigners and I'm always ready to discover new and original methods to study languages. I really think this is one of them. Using FlashSticks you can learn in a funny way because you have a pack of sticky notes divided by colors: the blue ones are for masculine nouns, the pink ones are for feminine nouns and the green ones are for other type of words (for example a verb or an adjective). Sticking this notes at home you can review new words you learned at school or you can learn new ones. For example you can stick the note with the word "bottiglia" on your bottle of water so that every time you drink you'll have that word at your sight and you'll remember it. You'll learn new words every day. In this way, you can study foreign languages on your own, as a self-student or if you are attending a language course you can use them at school with your teacher and then use them at home too to repeat what you've learned. 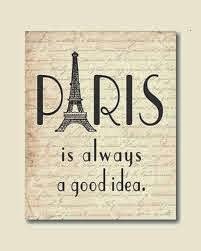 It is an effetive way of learning even if you're an adult and you don't have enought time to attend a language course. Using this coloured notes at home and sticking them around, you can learn in a passive way. 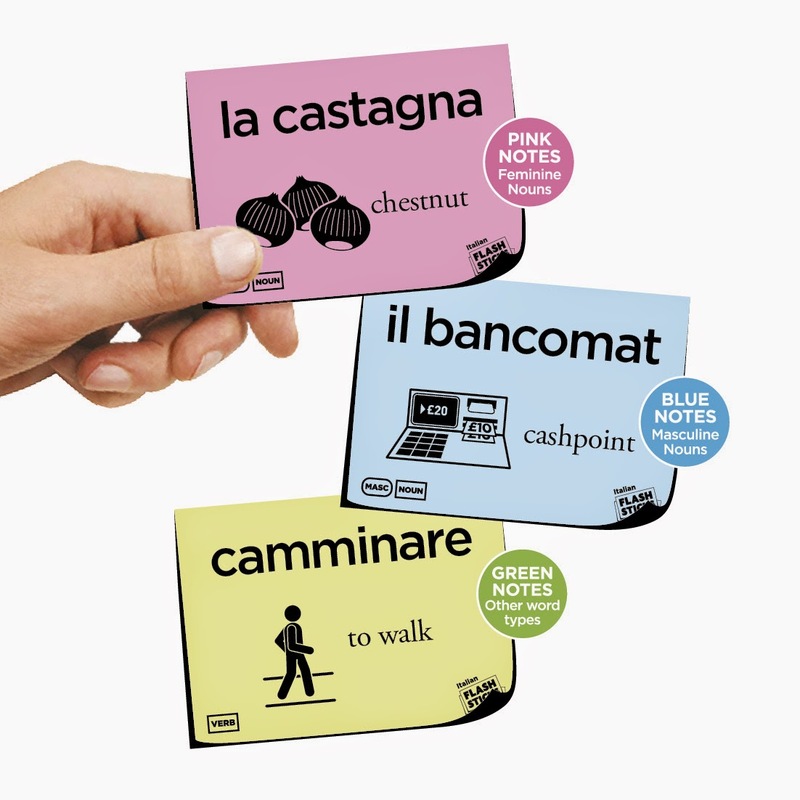 At the same time, you learn in three ways using Flashsticks: visually (thanks to the colors associated to the words), linguistically (you have the foreign word and the related translation on it) and phisically because you do things while learning. They are the perfect companion for language teachers because they can involve their students and interest them in a funny way. Finding tools to involve students of all ages is very important to me: they'll remember easier what you've explained using them. If you aren't able to catch their attention they won't probably be interested in your lessons. Another useful aspect of these sticks is the pronunciation. When we study a foreign language we also have to learn another way to pronounce words, surely different from ours. 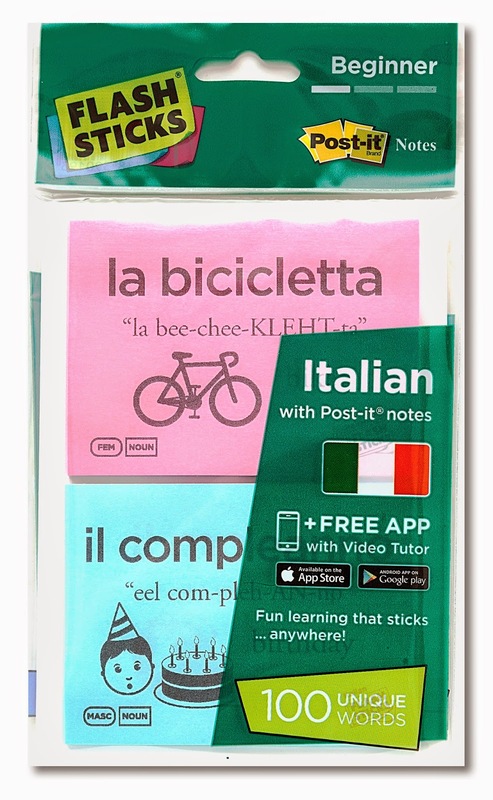 So, on the post-it we'll find the written pronunciation of the word we're learning and at the same time we can listen how to pronounce it using the FlashSticks App. You can go to Google Play or Apple Store and download the free App "FlashSticks". Then when you open it, you scan the word on your post-it and a video will appear: a tutor will pronounce the word for you. In this way you'll listen the right pronunciation whenever you want from a mother tongue person and you'll remember even more easily the word you scanned. The FlashSticks are available in 7 languages and in British Sign Language. For each language you find three levels: Beginner, Intermediate and Advanced. Are you ready to learn and have fun at the same time? 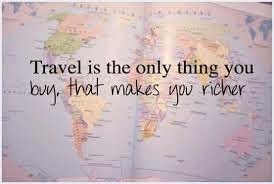 Go to www.flashsticks.com . P.S. I've wrote this review because I really think FlashSticks are very useful to people who want to learn a foreign language. Moreover, it's a company founded by young people who had a great idea and have become popular thanks to it, so I'm happy to promote it!